Some days are harder than others to get all 5 portions of your fruit and veg and I often find at the weekend when I’m not in as much of a routine food-wise, this is when I can miss out on those vital nutrients and minerals. Particularly this time of year when many of our everyday fruits aren’t in season, frozen fruit really comes in handy and it’s cheap and convenient for blending. Smoothies are such an easy way to give your body a boost of goodness and it really doesn’t have to be boring or over complicated. There are so many different variations and different ways of building them up, if you prefer a thicker consistency add a banana /avocado or sometimes I add a teaspoon of chia seeds and leave for a few minutes to soak up. For greens I often add frozen spinach as the taste isn’t as potent as fresh but still gives you the nutrients and vibrant colour! If you wanted to make it more substantial, adding some oats into the blender will increase the fibre and provide slow release energy too, great for breakfast. Some supermarkets provide a wider variety of frozen fruits than others, so if you really love a particular type of fruit, it may be worth buying extra to freeze when they’re on offer to save money. Try to freeze as soon as you buy or as soon as the fruit is ripe to ensure you keep as much freshness and nutritional value in as possible. Chopping the fruit into small pieces and putting them into zip-lock freezer bags will also make it easier for you later on, if you wanted to add smaller amounts for a smoothie for 1 person or to use for other recipes. 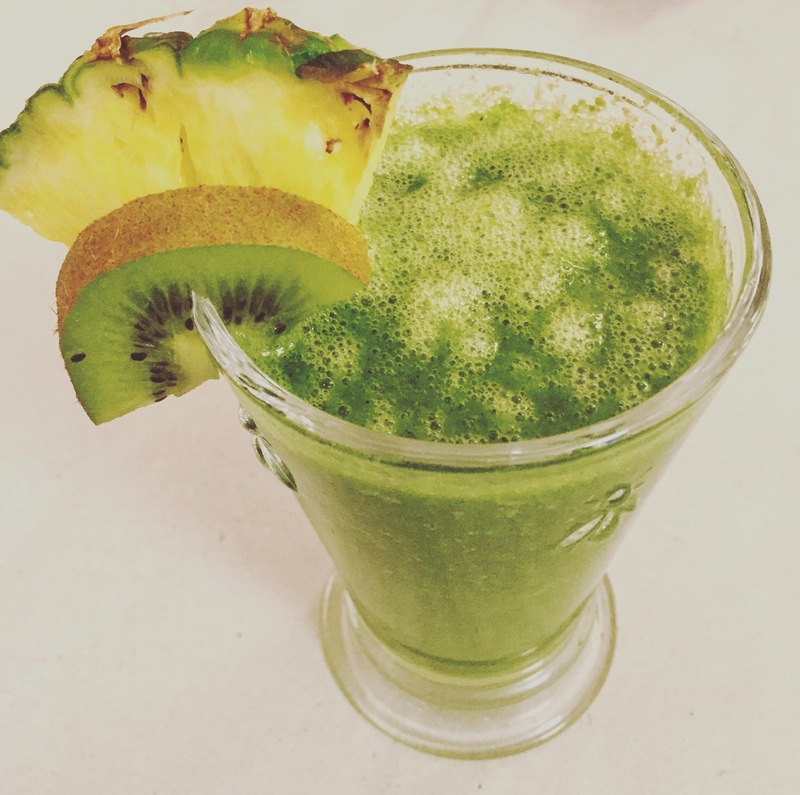 If you are new to making smoothie’s, this is a nice and easy one to begin with, it’s a mixture of fresh and frozen ingredients and its lovely and refreshing. Often shop bought smoothie’s contain banana to thicken them which some people aren’t fond of… so if you aren’t a banana fan this is for you! First blend the frozen spinach, pineapple and water together. Once smooth then add the kiwi flesh and blend again until this is fully combined. Finally, add the lime juice, give it a final blend and away you go!